Brussels, Belgium – Today, the Future of Privacy Forum (FPF) released Shedding Light on Smart City Privacy, a new tool designed to help citizens, companies, and communities understand the technologies at the heart of smart city and smart community projects as well as their potential impact on privacy. The guide was released by FPF Policy Counsel, Kelsey Finch, during the panel Cities of the Future, Data of the Present: Protecting Privacy and Fostering Development(Link Expired) at RightsCon Brussels, a conference exploring the societal impact of technology and policy. 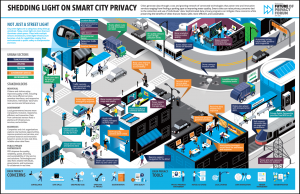 Shedding Light on Smart City Privacy highlights the wide range of connected technologies and services appearing throughout our communities – everything from streetlights that measure air and noise pollution to smart electric grids to buses that re-route based on demand. The visual guide also provides important context to these new technologies and services, allowing users to sort technologies and services based on what sectors they might serve, what other technologies enable them, and who within their communities might use or deliver them. 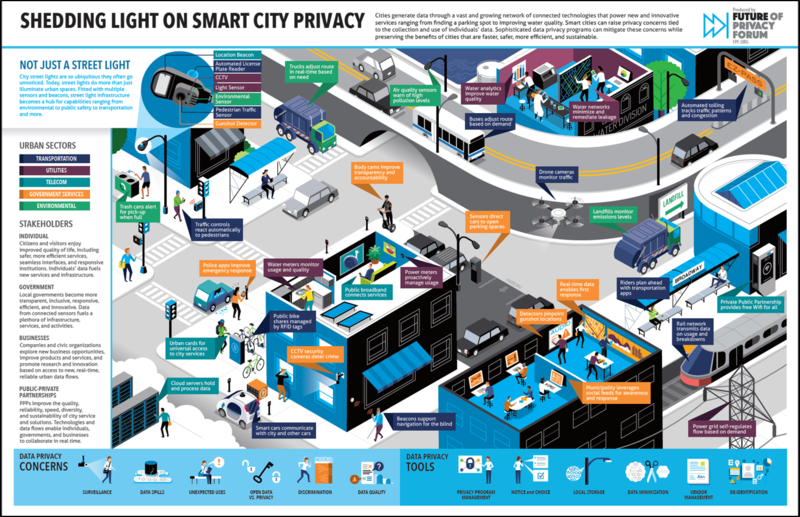 The visual guide also acts as a central repository for privacy-related guidance documents, best practices, reports, codes of conduct, and other resources that can help local policymakers, technologists, and citizens navigate these complex issues and integrate digital services in privacy-protective ways. The guide can be accessed at fpf.org/2017/03/30/smart-cities/.